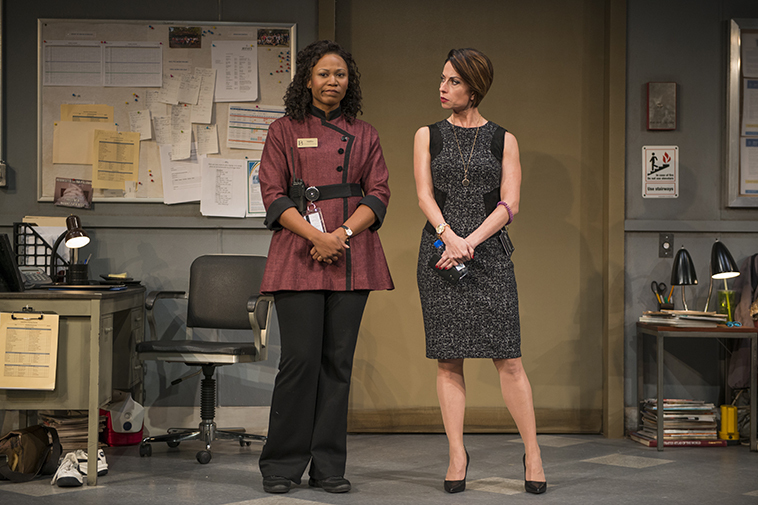 Steppenwolf Theatre presents THE FUNDAMENTALS. The show starts out with a slick video montage. This commercial by Projection Designer Stephan Mazurek promotes a luxury hotel. We are instantly sold on this elegant retreat from real life. Then, the branding spot finishes. The wall screen lifts and the reality is revealed. Ta-Da, the beauty and the basement. 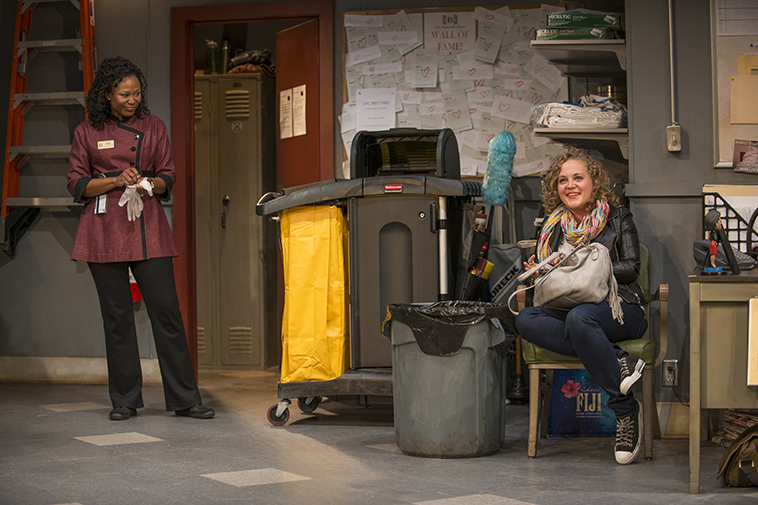 Scenic Designer Collette Pollard places us in a shabby housekeeping office. Maurek’s images showcasing a posh lifestyle contrast nicely with Pollard’s behind-the-scene overstocked toilet paper shelves. The grit feels authentic. The only hint of hotel glamour is an elevator that opens to reveal a wooden and brass car. The formal reminder of life out of the basement makes Alana Arenas’ (Millie) desire to be promoted that much more palpable. 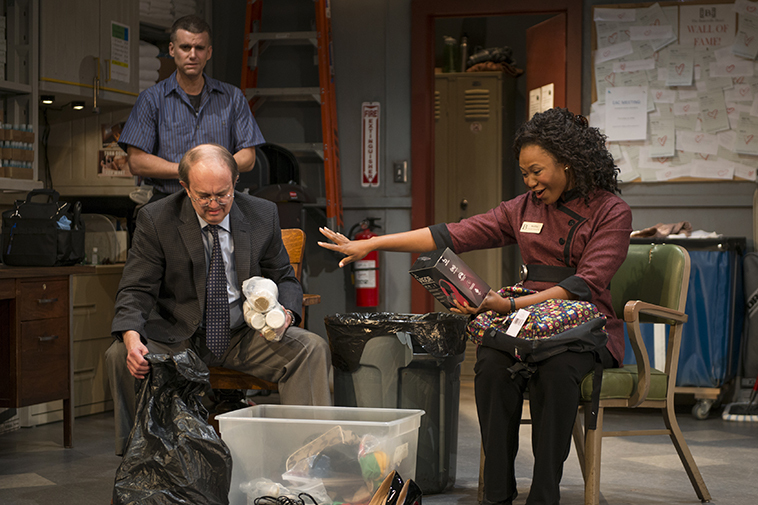 Playwright Erika Sheffer tells the story of a housekeeper who is overlooked for other positions because she is too nice and too good at her job. When Arenas befriends new front desk clerk Caroline Neff (Stellan), she gets lessons on how to step on people to get ahead. The story, although enjoyable, is pretty basic. We see the inner-workings of the hospitality industry. And we watch Arenas make uncharacteristic choices to get noticed. Although her actions surprise Alan Wilder (Abe) and Armando Riesco (Lorenzo), the overall transformation lacks tension. Even as she throws people under the bus, she is still likable. We understand her motivation and we are rooting for her to win. Her decisions are on the naughty-side of cruel. The play is more comedy than drama. Some of the best humor is delivered by Audrey Francis (Eliza). Francis plays the uptight manager that openly hates people. She delivers her barbs with edgy wit. Her interactions with Arenas are some of the best. Francis takes delight in Arenas proving loyalty to her, the hotel and the company. Arenas becomes less and less conflicted as people reveal their own agendas. A confrontation between Arenas, Francis and Neff goes into an every-woman-for-herself twist. THE FUNDAMENTALS is fundamentally an amusing but not memorable examination of human behavior. I left the hotel without any lasting takeaways other than be more appreciative of housekeeping. Running time: 2 hours and fifteen minutes includes an intermission.